WA farms are at risk of contamination by genetically modified seeds when strong winds whip across the state, officials admit. Organic farmers say their livelihoods are at stake as freak weather events, such as the thunderstorms that ripped through the Wheatbelt on January 27, become more common. Conventionally farmed GM-free grain can be contaminated legally by 0.9 per cent GM, but organically certified yields cannot contain a trace. A Department of Agriculture spokeswoman said that if GM canola seeds remained after the 2010 harvest, they could have blown on to neighbouring properties when “significant wind” events occurred in January and February. “It is unlikely that any movement of small amounts of GM seed remaining in paddocks would lead to non-GM canola crops in the 2011-12 season exceeding the 0.9 per cent threshold,” the spokeswoman said. But non-GM organic growers say that even this small amount of contamination risks their accreditation and could cost millions in lost revenue. GM seeds are manipulated by biotechnology companies that insert genes from plants, animals or bacteria to give the crops resistance to pests, diseases, weedkiller, drought or frost. In today’s market they sell for about $30 a tonne less than organic varieties. Just 11 months after an exemption order was issued in January 2009, which permitted commercial cultivation of GM crops in WA, Kojonup grain and sheep grower Steve Marsh was the first to be stripped of his organic certification after rogue seeds allegedly blew over his property. He is embroiled in a legal battle with neighbour Michael Baxter in what is predicted to be a multimillion-dollar landmark lawsuit. Mr Marsh said attempting to clean up the hundreds of thousands of tiny black-poppy sized GM seeds on his land was an impossible task. “There is so much seed now that has been shed out of the plant that there are seeds everywhere,” Mr Marsh said. 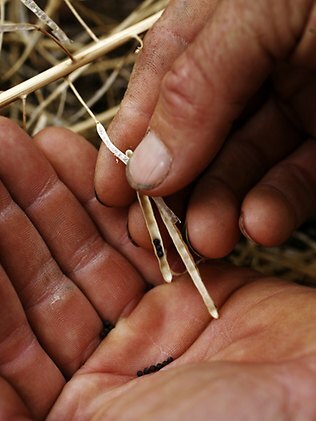 “All the visible plants will have to be removed by hand and cleaning up the seeds is impossible. “We will have to wait now until they (the seeds) germinate and then they are going to have to be removed. But this is the whole problem and this is what will have to be established legally and that is how long are those seeds going to be viable in the soil? “We have heard anything from a few years to possibly 16 to 20 years. Farm action group Network of Concerned Farmers spokeswoman Julie Newman said extreme market sensitivity and tests which could pick up low levels of contamination had left organic farmers’ livelihoods blowing in the wind. “The problem with GM canola if you have got it swatting then it will just blow away. Some farmers have gone into their paddocks after swatting and found no canola in their paddocks after a big wind storm,” Ms Newman said. “It shouldn’t be the non GM farmer who is expected to take the loss for any lost markets or price penalties,” Ms Newman said. “This is what is so wrong with GM is that it removes the choice for non GM farmers.” But Agriculture Minister Terry Redman said zero tolerance is unrealistic position in biological systems. “We have seven certifying bodies in Australia and all seven have different approaches when it comes to how they handle and manage GM. Meanwhile, a 2009 GM canola trial government report documents how windy conditions blew seeds onto neighbouring crops on at least two occasions. A statement on the Department of Agriculture’s website states that strong winds can move drying plants onto adjacent paddocks and farmers should plan for this before planting GM crops. This entry was posted in Big Agribiz, Black Ops & Dirty Tricks, Depopulation, Environment, Eugenics, Food Psyops, Food Safety, Genetic Engineering. Bookmark the permalink.